There are a lot of different people that you can get on your side in Far Cry 5 and use for your own benefit. 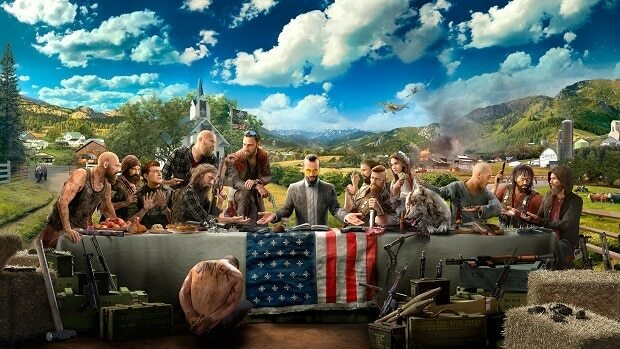 These people are in Far Cry 5 For Hire and you can do one thing or another to get them and use them. These companions can end up saving your life so this Far Cry 5 For Hire Guide will probably be very important for every player. This Far Cry 5 For Hire Guide will tell you about all of the different people and animals that you can hire in Far Cry 5. We will tell you about their specialties and how you can hire them. You can find specialists by seeing their icon when you hover over them on the map. Each specialist usually has two abilities which are unique and they can be recruited once you free up one outpost or the other. You can have up to three different fighters at one time or the other and can call the one that is the most useful. Specialists who follow you will engage any enemy that you fight. They can also attack specific targets and if they die, they only need to heal and they will soon be ready for you to use once again. You can reduce this time by having the Leader perk. This is a list of all of the specialists that you can hire in Far Cry 5. You can find Grace in Holland Valley at the Lamb of God church. She is a sniper that is lethal and has Boom Boom (her sniper shots scare enemies) along with Friend Sight (you can distinguish her laser much more easily). You should use her to take out lethal enemies which will be quite difficult to kill for yourself. Find her at the Lamb of God church and clear out the cultists around it to start her quest. Get to the top of the church and protect Grace and the mausoleums for her to join you. Nick is a pilot that can either bomb a specific target when you mark it, or it can perform a strafing run. His plane Carmina is only useful when you are outside and have a significant distance between you and your enemies. Do not use Nick if you are against fighter planes and mounted weaponry. To get Nick, go to Rye and Sons Aviation to defeat the cultists and then retrieve his plane from the Seed Ranch. Once you are in the plane, you need to destroy some property that belongs to the cultists to finally get Nick on your team. This guy has an RPG which can not only track vehicles on air and land, but also deal bonus damage when it hits a vehicle. Use Hurk to take down enemy aircrafts or convoys. Make sure you do not use him when performing rescue missions, fighting in close quarters or trying to capture vehicles. To get him, go to Fort Dubman to talk to his father and retrieve the truck. Clear out all enemies until you get the truck and drive it back to the fort. When you do this, Hurk Senior will ask you to take his son with you and that is when he will be available to you. Jess is a hunter who can be almost impossible to detect by the enemies and has a special affliction towards animals which makes her seem like she is not a threat to them. Use her to kill cultists out of range with her bow. However, make sure you do not have her deal with armored targets, as she will be useless. Liberate the Baron Lumber Mill and speak to her there. Now help her track down ‘The Cook’. Free the captives and defeat Cook along with his guards to have Jess join you in your quest. Adelaide is another pilot who can give you a helicopter whenever you need it. Apart from this, she can deal sustained damage to the enemy due to her having a massive magazine in her helicopter. This is extremely useful because she can provide you suppressing fire in a tricky situation or help you get out of it. Go to the river region to speak to her and hunt down Tulip, her prized helicopter. You also have to kill all of her friends who betrayed her. Get her helicopter for her and then take down all enemies who are trying to take it back. Once you have done that, land it at the helipad mentioned on your map and Adelaide will join you in your quest. This guy uses his flamethrower to wreak havoc. He is also resistant to almost every explosion and their impacts. Beware of him though, as he lights the terrain on fire and you can burn yourself in it. All you need to get Sharky Boshaw on your team is to shut off the music in the speakers around the trailer park and take out all enemies there. For a detailed guide on all of the animals, take a look at our Far Cry 5 Animal Companions Guide. It has detailed instructions on how to get and use the animals available to you. Boomer is used as a Scout who can tag all nearby enemies and can fetch a weapon for you from a dead weapon. Boomer can be used to defeat simple enemies but is not good against advanced fighters. You can find Boomer at Rae Rae’s Pumpkin Farm and do his quest to have man’s best friend by your side. Cheeseburger is a bear who can attack enemies for you and draw their focus. He can easily take down multiple enemies and entire outposts for you. It is best to use him against angels and melee targets. To get Cheeseburger, clear the F.A.N.G center and speak to Wade. Then catch Cheeseburger’s favorite fish and feed it to him. Once you get him the fish, defend him against cultists and you will have him on your team. Peaches is quite stealthy and can be used to free outposts or ambush targets. She can silently take down enemies and can hide in tall grass as well. To get her on your side, talk to Miss Maple at Peaches Taxidermy and then track down Peaches. Defeat all the Cultists in your path and lead Peaches back to Miss Maple by laying down treats for her all the way to the taxidermy. Once done, talk to Miss Maple. These are random fighters who have a couple of abilities randomized for them. Here is a list of all of the abilities so that you can pick out the fighters suited to your style of play best. Thick Skin: Can take a lot of damage. Hoarder: Allow you to carry more ammo. Veterinarian: Revives your Fangs for Hire. Sharpshooter: Will have deadly sniper fire. Quick Recovery: Have a faster health regen. Herbalist: Will grab plants when not fighting. Fortitude: Draw enemy focus away from you. Intimidator: Will scare the enemy with gunfire. Back Up: Revive themselves when they are down. Recycler: You will get recovered ammo from them. No Tracks: You cannot be traced through tall grass. Hot Buckshot: Their shotgun pellets are flammable. Vulture: Will find you extra stuff when you are looting. Spotter: Tag enemies for you at the beginning of fights. Power Hitter: Can send enemies flying upon melee attacks. Field Surgeon: They revive your health whenever you are down. That is all we have for our Far Cry 5 For Hire Guide. Let us know if we missed something using the comments section below!